Epcot has a found a way to engage children while visiting the World Showcase section of the park. They have created a series of 11 activity centers called Kidcot Fun Stops. 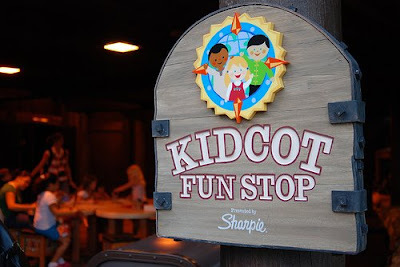 In each of the countries represented in Epcot’s World Showcase (Canada, Great Britain, France, Morocco, Japan, United States, Italy, Germany, China, Norway, & Mexico) there is a Kidcot Fun Stop. Children can go there and pick up a mask that they can decorate. At each stop, they can add to their personal decoration, and they can get a stamp from that country, and a special ornament to add to their mask. The Cast Members working at the Kidcot Fun Stops are actually from the countries that they represent and are happy to answer questions that the children have about that particular country. This is a great way for your children to learn a little about different cultures and far away places. As the children work their way around the World, their masks get fuller and they get excited as they try to collect stamps from all 11. In China, they help the child determine what animal they are associated with based upon the Chinese calendar and the year that they are born. Often the Cast Members will write the child’s name in Chinese on the mask for them as well. The mask makes a nice keepsake for the child to remember his or her visit to Epcot. There is also special “gift” if they visit all of the Kidcot Fun Stops. Besides being a fun activity for the kids to do, it’s great that it is FREE. You can start the process at any of the 11 stations. There is no particular order that you have to go in, which makes it very flexible. Visit a few or visit them all, but take advantage of this opportunity to keep the kids engaged and let them interact with friendly Disney World Cast Members from all over the world. 0 comments to "Epcot Kidcot Fun Stops Let Kids Learn While They Are Having Fun At Disney World"